We owe this recipe, and some more variations to come, to the $5 Five Below gift cards that my kids got as a party favor. While my kids were exploring their options at Five Below, I got bored and started looking at the table with the books.I spotted one with nice photos of Whoopie Pies, written by Angela Drake. 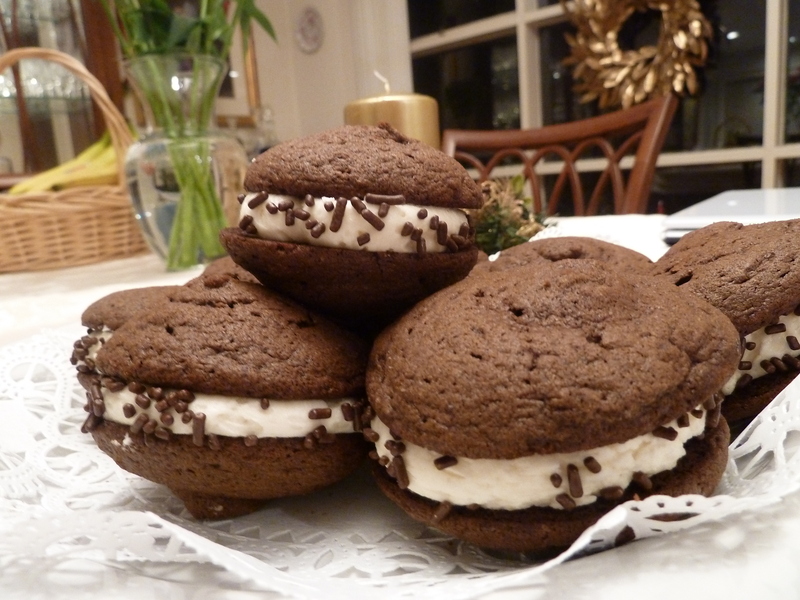 An entire book on Whoopie Pies alone. The ingredients were all simple and I liked the variations. My kids just loved the book so we had to buy it. Then, they studied it religiously and bookmarked their favorite recipes. Here comes the first bookmark. I loved the biscuit but this filling was too sweet for me. Next time I want to try a filling with cream cheese. How to make the biscuits: Combine the flour with the baking soda, salt, and cocoa. Beat the softened butter with the shortening, sugar, and grated chocolate until it becomes fluffy and whitish. Add the egg, the vanilla and half of the flour mix. Mix. Add the milk and the remaining flour. Beat very slightly until the batter is evenly combined and moist. Pipe or spoon the batter on lined cookie sheets. Bake in pre-heated oven 350F/180C for about 10 minutes. You know they are ready when you touch them softly and they are firm. Use a spatula to transfer them to a cooling rack and prepare the filling. How to make the filling: Beat the softened butter with the vanilla extract for about 2-3 minutes until it’s creamy and whitish. Add the cream and beat some more. Gradually, add the confectioner’s sugar and beat some more until it’s all evenly mixed, about 2-3 minutes. Assemble time: When the biscuits have cooled, pipe or spoon some filling on the flat side of one biscuit. Stick the other half on top and sprinkle the filling with the chocolate sprinkles. Ready to impress! Notes and tips: Last year I got the Wilton decorator from Bed, Bath & Beyond and I’m loving it! 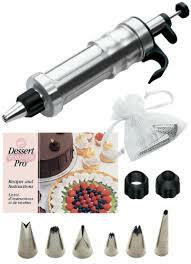 I used it to pipe the biscuit batter evenly for baking and also to apply the filling. Tastes awesome for making it the first time!